Sometimes it doesn't all go to plan on results day, but that doesn't mean it's all over. There are some pretty weird university degrees out there if you want to just go off the rails and study something a bit rogue. If you're interested in Contouring, Golf, Football or even Advanced Baking – there's a course out there for you. So sit back and relax, because here's some courses that may be bizarre, but hey it's just a degree and a whole life of debt, right? This course looks at the "wicked problems" in the world, and sees you looking at how the ecosystem is changing, health impacts and public health and social and cultural and economic aspects of public health. Day to day expect to be lectured on how humans are destroying the earth and what can be done to stop us. This sounds fun, who doesn't love the sound of designing necklaces and stuff? In your third year you get to create a portfolio of your work and have master classes in workshop making skills and after the course "you will be equipped to become an independent maker, or find employment in wider creative design, or through teaching, community arts, or postgraduate study." The success stories for this course contains a lot of jockeys and event riders. I think it's just for people that really love horses. First line of the description: "Understand the science underpinning the bond between humans and animals." Yeah sure, sign me up. Day to day expect to up close and personal with a lot of animals, which sounds wonderful. 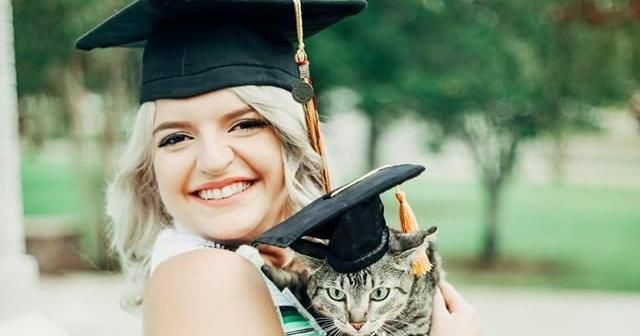 You and the cat can both graduate! Okay, wait here a second – what does this one even mean?? The technology of garments??? Apparently the course has excellent links to international fashion brands, including Burberry, Karen Millen and George at Asda. If you ask me, the course looks like it's just another way to say fashion, you're studying fashion. If you want a fast track to being a uni sad boy, here's the course for you. There's not much else to say other than you learn about football, so if you want take a look at the course listing here. This course asks for CCD grades and is available through clearing. In the third year, students must complete a "research dissertation or personal adventure". The website says it's "perfect if you're curious about Bear Grylls". The course looks full of action, exercise and the outdoors. It basically sounds like the perfect degree for if you want to work at Center Parcs. For just 80 UCAS points, you can go to sunny Cornwall and student tournament golf. The course is only for those that are "ready to take their game to the next level" so make sure you drop that in your personal statement, and you'll require "drive, determination, application and most of all effort and commitment". You get to go to Portugal for some training and the course ends in March each year – just in time for the golf season! You'll learn about brand image, tournament golf as a business and golf psychology. This course sounds like a hole in one. Channel your inner Kim K with this one, you can study the art of body contouring through fashion. Think structured lingerie in this "fashion degree different to all others". If you're wondering what you might get up to day to day on this course, it's stuff like fabric manipulation and learning the "skills required within the body contour industry". And, you have to do a dissertation in the third year. If this sounds right up your street, also see contour fashion at De Montford. 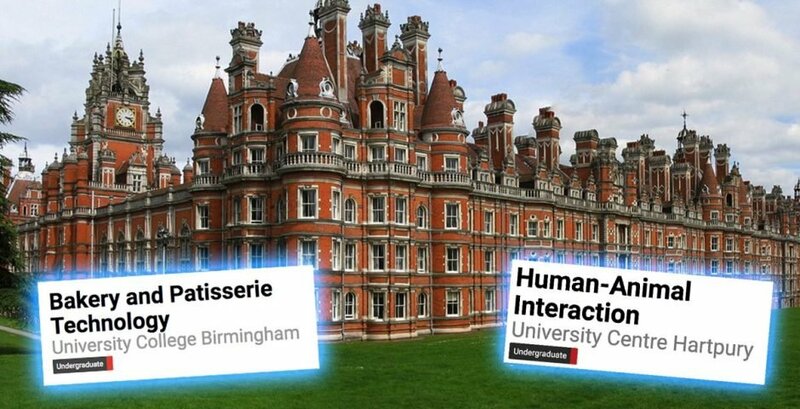 For a small fee of just £9,250 a year you can study the technology of cakes!! Surely this course is just every day they bring you into a big room set up like the bake off tents and then you go wild making some sort of crazy cake or pastry. Nope, according to the UCB website you actually do a fair bit of theory too. However, modules listed include "artisan bread", "advanced confectionary and chocolate" and "bread production". Yep, you study bread and chocolate. Where can I sign up? Note: Advanced chocolate is not for the faint hearted.